Gopi Krishnan is a visionary and the man behind Fortius Infra. From land identification, acquisition, conceptualization, financing, development, sales & marketing, property management and asset management, Gopi's two decade long career in the industry has helped him identify with every aspect of the property development business cycle. Gopi is a Fellow of the Royal Institution of Chartered Surveyors (FRICS). A mechanical engineer by training, Gopi's first job was with HCL in 1988. 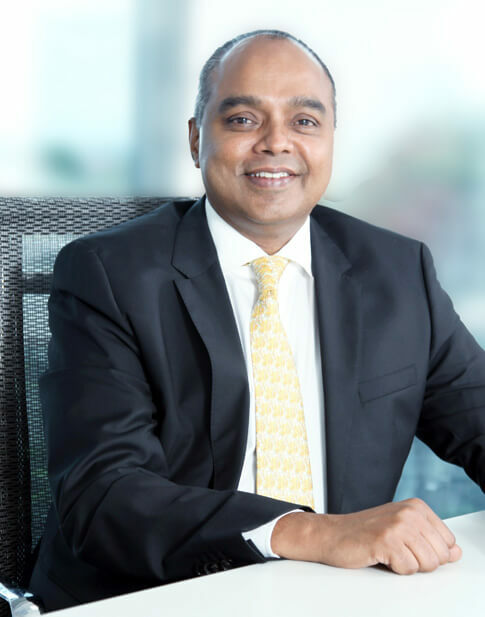 It was 6 years later, in 1994 that he decided to make his first radical career move and joined the Embassy Group – a family-managed property firm, based in Bangalore. Gopi began his 19 year long journey with Embassy as the group's marketing manager. In 2006 he was appointed CEO of the group with complete operational independence. By 2012 Embassy had transformed into one of the most flourishing IT/ITES developers in the country, with projects all over India, South Asia and Eastern Europe. Its clients comprised of some of the largest Fortune 500 companies across the globe. More importantly the group had developed into a completely professional organization, with a strong emphasis on ethics, values and business acumen. 24 million square feet of space, which is about 80 percent of total space developed by the Embassy Group since its inception, was developed under the direct leadership of Gopi Krishnan between 2006 and 2012. And this feat was managed by a small team of about 80 professionals, with ingenious use of the outsourced model and strong relationships with service providers. Armed with his experience and professional associations Gopi decided to replicate this success story for himself. This was the beginning of his journey from a corporate executive to the new-age entrepreneur. Today he is the Managing Director and promoter at Fortius Infra, the company that he founded in May 2013.